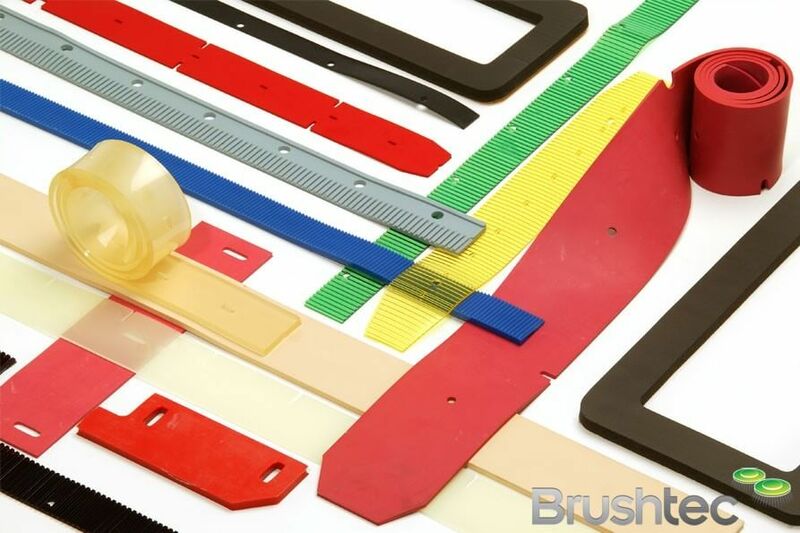 Put simply, Brushtec’s experts have gone to great lengths to ensure that our squeegees will work perfectly with your specific automatic scrubber machines. Please call us on 0191 229 1666 or email us if you’d like to speak with an expert. 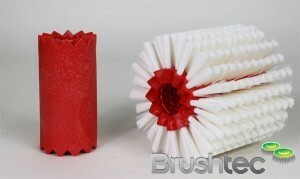 Moulded squeegees can also incorporate ribs to help allow water penetration into the vacuum area. Brushtec operates cutting presses of up to 60 ton in order to process its squeegees and tank gaskets. Polyurethane is used for our top quality squeegees. Polyurethane is oil and chemical resistant, it withstands temperatures from -30 to +70 degrees Celsius. We supply it in shore hardness from A30 to D75. It is by far the hardest wearing squeegee material. It can also be coloured and moulded with ribs if you require. Linatex is used as an economy squeegee material. It is a red rubber (95% latex) and we cut it from 40 durometer sheet form. Linatex or Para has a high resilience, as well as cut and tear strength with good abrasion resistance. Linatex is not oil resistant when used as a squeegee. Nitrile is a low cost black rubber, that is tear and oil resistant. We use this as a side squeegee for splashguards. 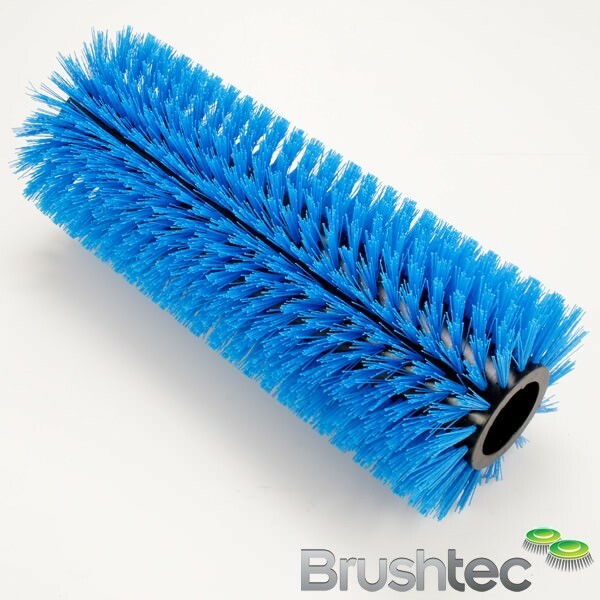 If you are interested in squeegees for automatic scrubbers, then you may also be interested in our other floor cleaning machines products, such as our municipal brushes and industrial cylinder brushes. THE EARLIEST automatic scrubbers appeared in the 1930s. Then, as now, they were designed to scrub and clean the floor, pick up the water and leave it clean and dry in one action. 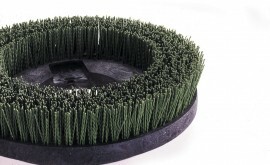 Over 70 years, the basic design of scrubbing action and squeegees for solution recovery has not changed. Manufacturers have increased the vacuum power and introduced simpler squeegee systems but long, dirty streaks and mopping of wet floors after auto scrubbers is still a common sight. Poor squeegee adjustment costs the cleaning industry hundreds of thousands of dollars each year in extra labour, increased frequency of stripping and sealing and lost contracts through dirty or yellowed floors. Before we adjust the squeegee, we must understand its action. There are front and rear blades on a squeegee. They must contact the floor evenly along the length of the squeegee assembly to ensure a good seal to maintain vacuum and maximise and concentrate the airflow. The front blade allows solution on the floor to pass through channels or notches in the blade into the squeegee tool while maintaining vacuum to provide lift. It has to provide a seal but doesn’t wipe the floor and generally does not wear as quickly as the rear blade. The rear blade is the wipe blade. 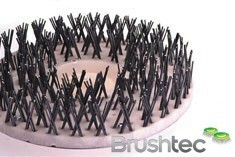 It has a smooth, sharp edge, which wipes the floor to a near dry condition. The rear blade wears out much more quickly than the front blade and must be in good condition to properly do its job. Blades should be changed when worn, torn or of unequal length. Newer scrubber designs have two or four sided blades and tool-less blade change systems, allowing the operator to change the blade. These features will save you money, provided the operator checks the blades before every use and changes the wearing edge before it is worn more than half the thickness of the blade. Adjusting a squeegee assembly is a two-part process. Firstly the squeegee must have the correct pitch. In other words, it must sit level on the floor when in the working position for the squeegee blade to have the same deflection at each tip as well as in the centre. This is especially important on curved squeegee assemblies. A curved squeegee with a slight pitch to the front will quickly wear out its wing tips and the rear blade will lose contact with the floor in the centre of the tool. Uneven tip wear and a water trail from the centre of the blade are symptomatic of too much forward pitch. A curved squeegee with a backwards pitch will wear the blade out in the centre while providing little or no pickup at the wing tips. The second adjustment is the amount of deflection or down pressure on the squeegee blade. Before adjusting the down pressure you must first adjust the pitch to ensure that blade contact and deflection is equal across the width of the squeegee. Step 1: Getting the squeegee level on the floor – how to adjust the pitch. Before you adjust the pitch, carefully read the instruction manual for your machine and locate the adjustment devices for your machine. Check the wear edge of the rear blade. Change or rotate the blade if it is damaged or is less than half the original thickness. Change or rotate the front blade if it is torn or has an uneven edge. Choose a smooth level surface. Turn on the power switch and the vacuum, lower the squeegee to the working position. Release the parking brake (if fitted) and drive slowly forward approximately 60 cm. With the squeegee down, stop the machine by turning off the power and set the parking brake. Do not allow the machine to roll back. Now look at the rear squeegee blade. There should be equal deflection of the rear blade across the entire width of the squeegee. If the rear blade barely touches the floor at the centre then there is probably too much pitch to the front. If the blade shows a lot of deflection in the middle it means that the pitch is too far back and needs to be adjusted forward. Turn the machine on again and repeat steps 2 through to 4 until equal deflection is obtained. Step 2: Adjusting the down pressure – getting the correct amount of deflection. This is where many machine operators come unstuck as they use the down pressure adjustment to cure all faults. Too much down pressure forces the sides of the blades rather than the edge of the blade against the floor surface. A blade with too much down pressure will smear the floor instead of wiping it dry and the blades will quickly wear paper thin. A blade with too little deflection will leave chatter marks on the floor. Having adjusted the pitch and achieved equal blade contact you now need to adjust the downward pressure on the squeegee. The aim is to achieve a rear blade deflection of approximately 10 mm. On the same smooth level surface drive slowly forward approximately 60 cm with the vacuum on. With the squeegee down, stop the machine, turn off the power and set the parking brake. Do not allow the machine to roll back. Observe the amount of blade deflection. It should deflect 10-12 mm across the entire width of the squeegee. If the deflection is less than the desired amount increase the down pressure. 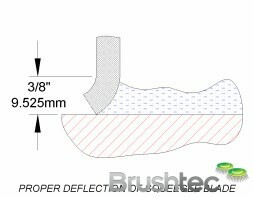 If the deflection is more than the desired amount, decrease the squeegee down pressure. Turn the machine on again and repeat steps 6 through to 8 until correct deflection is obtained. Test run the machine observing water pickup patterns over a suitable area of floor. Make further adjustments if necessary. Corrosion is the enemy of all squeegee systems. They operate in a constantly wet environment. The detergent in the water, plus the dissolved and suspended soil, breakdown and contaminate greases and metal threads quickly seize in aluminium housings. Ensure that all pivot points, screw threads and moving parts on the squeegee system are regularly lubricated with a suitable water-resistant lubricant.